In Windows 7 operating system, Microsoft has introduced a lot of new features . Taskbar in Windows 7 has undergone extreme makeover and look different from previous Windows releases. Now, taskbar looks more like taskbar on Mac OSX system. While few users like the new look others still prefer the good old look. Old or new, you can easily customize the taskbar for look you like. 1. Right click on an empty space in taksbar and click on properties. 2. 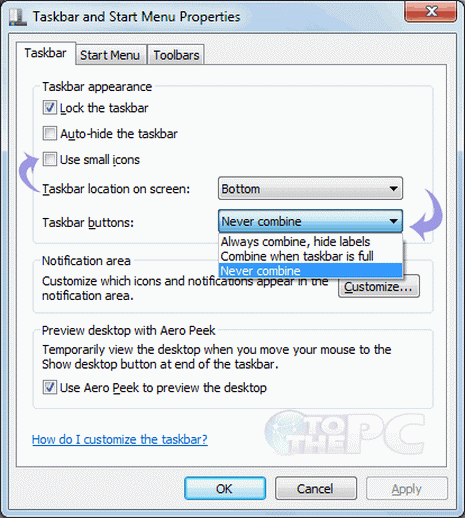 Under taskbar tab, click use small icons option. 4. Click OK. Now enjoy Winodws 7 and Windows XP looks on the same PC. Yeh it’s great, now if we could only get the colors that appear on the buttons when you hover your mouse over them to appear all of the time.